Andros’ new innovative poly-tubing layer incorporates functionality and performance. This new advanced TBL layer provides SX mining operations the security to know that this vital component to their solvent delivery system will hold up to the harshest environment, no matter where on earth they are used. 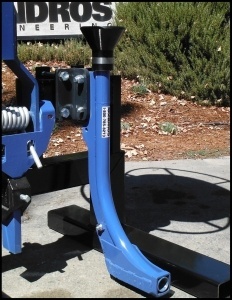 Our newest mining applicator uses a Hi Chrome encased boot that secures all of the ground engaging sections. Easily removable, this boot protects against abrasion, and provides a visual a wear gauge helping field technicians know when to change out the boot. Finally, the new TRL Layer is equipped with our engineered mechanical break away clamp that features a protective trip design, increasing the useful life of the TBL Layer.